The process settling of solids (dead yeast cells, leftover grape skin fragments, etc.) to the bottom of a vat of wine or must. Tasting term used to denote the taste characteristic given to wine by the presence of acetic acid (vinegar) in small amounts. As little as 0.1 percent acetic acid in most table wines will render the wine undrinkable or, at least, unsaleble. Typical judging procedures around the world call for removal of points off the score of any wine found to have noticeable excessive asescence. Chemical name for the major component of vinegar. Acetic acid is produced in wine from alcohol by acetic acid bacteria in the presence of air. Acetic acid is the major volatile acid that occurs in foods, and its presence is usually considered to be evidence of bacterial spoilage. The taste and flavour is quite fruity and, to be fair, it must be admitted that small amounts of acetic acid and its esters are natural flavour components of a great many fruits and fruit juices. Primary flavour component of Flor Sherry. A particularly mean, chemical-smelling, fruity liquid found on the shelves of organic chemistry laboratories, and never to be opened. Pure acetaldehyde has a sickening-sweetish-perfume odour that is better left under the cap. One smell gives me an instant headache just behind my right eye that doesn't go away for hours. The sour or tart taste in wine and other food. The primary natural acid in grapes and wine is Tartaric acid; the second most abundant is Malic acid. Acidity contributes to the keeping ability of fine wine. The "shadow taste" remaining in your mouth just after swallowing a sip of wine. Important in wine tasting because it can reveal an extra attribute or fault which might not otherwise be obvious. Term describing the storing of wine under certain specific conditions for the purpose of improving the wine. Aging of wines (usually red wines) for long periods in oak barrels adds oak-flavour and makes the wine more complex. Aging of wines (either red or white) in bottles develops a pleasing taste and odour characteristic called "bottle bouquet." Wine region in north-western Germany, not famous for its wine quality in particular, but rather because the vineyards are the most northern in the world! The region is small, but very old as European wine regions go. Wine records there have been found dating from the third century, A.D. In recent centuries, the wines were mostly Spatburgunder (Pinot Noir originally brought from Burgundy) but, in this century, white varieties bred for cold resistance and the ability to ripen crops in short summers have become more important. Swiss wine of superior quality produced From the Fendant grape (Chasselas) in the canton of Vaud. 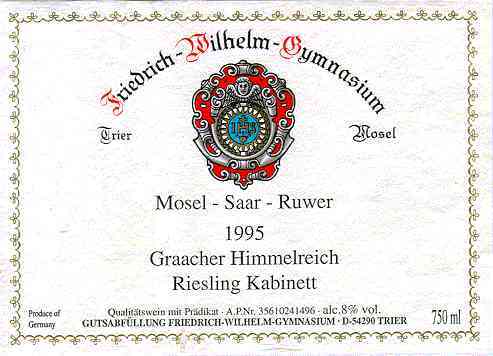 (white Grape) that is a cross between Riesling and a Sylvaner clone and created in Wurzburg . Limited growths in Rheinhessen region. Used to create good "Auslese" style white wines in better years, as it is susceptible to botrytis. Literally, old vines, in French called vieilles vignes. An old vine differs according to vintner, usually 30-years plus, some as old as 80 years on sites such as Mühlheimer Sonnenlay. (red grape) this is a crossing of Dornfelder and Lemberger developed at Weinsberg/Wurttemberg Research Station, Baden, Germany in November 1999. Has synonym name WE 71-816-102. Cross. Variety is early ripening and has good yield, producing red juice with deep colour and pleasant tannin content. ethyl alcohol, or "ethanol." Other alcohols, if present, occur only in minute amounts and are usually thought of as flavour components. Ethyl alcohol adds a hot, sweetish taste to wines if present in too high a concentration. Conversely, if its alcohol content is too low, a wine may be thin, unbalanced and lacking in body. A book which describes the structural characteristics of various varieties of grape vines. Used for identification of vines in the field. An ancient wine jar, made of clay, with two handles on opposite sides near the top. Amphorae are periodically discovered at the bottom of the Mediterranean Sea, where they have lain for centuries, since the shipwrecks that left them there. (red grape) a small amount planted in the Saale Unstrut area, it is a crossing between St Laurent and the Blaufrankisch and originated in the Czech republic. Broad term for sweetening must before or during fermentation. Whereas chaptalization means the addition of sugar only, enrichment also includes the addition of grape must, concentrated grape must, and RCGM. Any wine served before a meal. Traditionally, aperitifs were vermouths or other similar wines flavoured with herbs and spices. A term used in sensory evaluation of wine to describe whether a wine is crystal clear (brilliant), cloudy, or contains sediment. It has nothing to do with the colour of a wine. A soil fungus, hArbored by oak roots which is particularly devastating to grape vines. If a grower plants new vineyard in a field which had previously held oak trees, he must fumigate the soil prior to planting, lest the residual Armillaria (Oakroot Fungus) kill his new vines within a year or two! The blending together of component wine lots to form a final composite intended for bottling, for aging, for sparkling wine production or for some other use by the winemaker. Also the name given to formal membership conclaves of the wine fraternity "Knights of the Vine." Sensation of taste, caused by tannins in wine, which is best described as mouth-drying, bitter, or puckery. Unit of measure for pressure inside a bottle of sparking wine or Champagne. One atmosphere equals 14.7 pounds per square inch, the standard atmospheric pressure at sea level in the world. Commercial sparkling wines commonly contain 4 to 6 atmospheres of CO2 pressure at room temperature. A Prädikat category for sweet wines from Rust in Austria. The grapes have undergone noble rot and have a must weight of more than 27 KMW. Maturation or ageing of wines. A rank of quality for Austrian wine requires that grapes have been completely affected by noble rot and have started to shrivel. Harvested grapes have a minimum must weight of 27° KMW. Freshly pressed most or late harvest wine from the same vineyard can be added to the grapes before vinification. Ausbruch wine must have a minimum of 5% alcohol. German word meaning "selection "or selected harvest. In German wine law, auslese has a specific meaning which requires that the wine be made only from selected bunches of grapes, riper than those others which were discarded. (white grape) This is an Alsatian grape variety that is related to the pinot Blanc. It is grown in the Kraichgau region of Baden. Austria produces mostly white wines that are often of good quality. The red wines have no special features and are not often exported out of their area of production. Nevertheless, there is one supple and fragrant red wine that deserves to be mentioned: it is produced from the Pinot Saint-Laurent variety grown in Lower Austria in the Vöslau region. As for white wines, the principal varieties are first of all Grüner Veltlinger, which represents over 30% of the total vine population. It gives a fruity and smooth pale green wine, that should be drunk young and which is highly sought after by the Viennese. It is called 'Heurigen' when still new, and is served in open-air cafes by those wine-makers who produce it, especially in Grinzing, Nussdorf or Sievering, a suburb of Vienna. The other two main grape varieties are Müller-Thurgau and Welschriesling, which is the most interesting. It is grown in Burgenland, Southeast of Vienna, and around Falkenstein to the north of Vienna near the Czechoslovakian border. It either gives a light and fruity wine, slightly sparkling; or a highly enjoyed heady, sweet and rich wine in late vintages. Two local varieties - Rotgipfler and Zierfandler - which are somewhat rare, are blended in the making of Gumpoldskirchener, a heady wine bearing the name of the locality where the vines are grown, to the south of Vienna. The main wine-producing regions are located in eastern Austria. Around Vienna one can find, to the west the region of Wachau encompassing Krems and Dürnstein along the Danube and the Kamp valley, of which Langenlois is the center. To the north of Vienna, not far from the Czechoslovakian border, one can find Weinviertel (literally: the wine district). Close to Vienna and until one reaches the suburbs, one can drink all local wines. This is also where Gumpoldskirchener is produced. To the south-east is Burgenland, near the Hungarian border and Neusiedl lake, where one can among others, taste a late vintage wine: Ruster-Ausbruch. The last wine-producing region is Styria, between Graz, the capital, and Radkersburg on the Mur River at the Yugoslavian border. Alzey was the home of a wine research institute . Assmannshausen famous for its red wines.